I was going to do a post this weekend on the Japanese Type 94 Nambu pistol, but a few things didn't happen on time so i had to push that one back til next week. Instead, i thought i'd use some old notes from last year from an aborted thread on US service weapons and do a little write-up on American service handguns, to showcase a couple new additions to my own collection. I know i know, you could have had a long, overly detailed thread on a foreign pistol you probably don't give a flip about anyway, but instead you are getting a pretty short one about some made in the USA pistols. Life's unfair like that i guess. I am not an expert when it comes to American milsurp. I have some and i like it but many many others know so much more than I do. Still, why not show off what I have and open up a general discussion on Am-Surp and really anything American military from WWI through Desert Storm. As we all know, the Colt Model 1911 pistol was the brainchild of John M. Browning, which could trace back its roots to the dawn of the 20th century. The pistol underwent extensive trials, testing, and modification; before finally being officially adopted as America's first automatic/self loading service sidearm. The design was first entered into military trials in 1899 and was pitted against other early autos such as the Mannlicher Steyr M1894 and Mauser C96. Later in 1903, the DWM Luger was also evaluated by the United States military and tested along side Browning's 1900 design. General William Crozier was an early strong supporter of the notion of an automatic pistol to replace the revolver and he motivated further efforts when things got a bit bogged down with redtape. It seems he was particularly impressed with JMB's prototypes. In 1904, Colonel John T. Thompson proposed that the new handgun should be chambered for a.45 caliber bullet, rather than a .38 caliber. Seems he really liked 'stopping power' or maybe he just had a bunch of kids hopped up on PCP living in his neighborhood? Regardless, his idea would be well received and shape all future trials held to select the new service weapon. In 1906, another rround of trials was held, with all entries chambered for a .45 caliber round. Browning/Colt's design was entered of course, along with one from Savage. 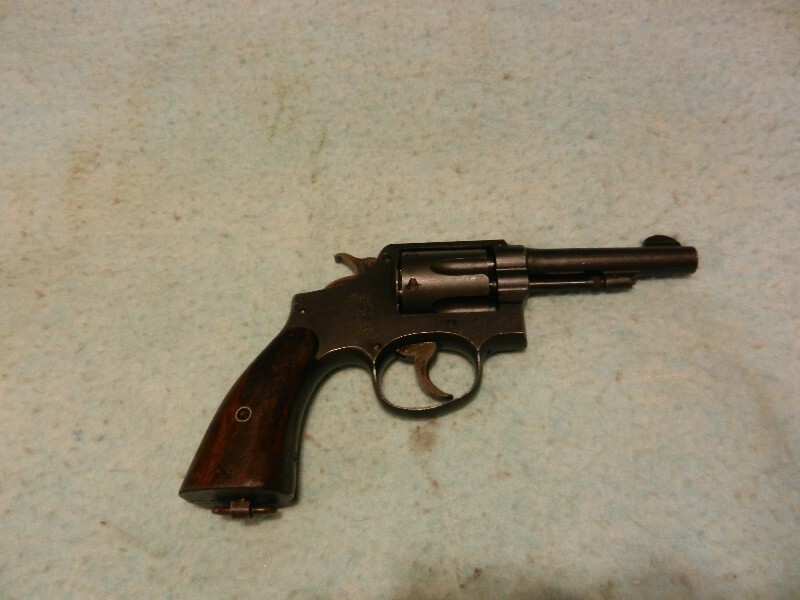 DWM also entered a Luger variant, but it was quickly washed out. Many claim this was due to favourtism shown towards the two American designs, but I think the military boards just realised that having both American and German soldiers armed with Lugers would just be too confusing for Hollywood a century later. Throughout the period between 1907 and 1910, both the Colt and Savage designs continued to be tested and improved; but finally in late 1910, the Colt was selected. It was felt that it was more reliable than the Savage pistol. So one would go on to be the most successful automatic handgun in the USA, and the other as a relatively unknown historical footnote. In March of 1911, the US Army adopted the extensively tested design as the Model 1911 Automatic Pistol. Both the Navy and Marine Corps would follow suit in 1913. Thus it would be the standard issue sidearm of US forces during the First World War. During that war, three manufacturers produced M1911s: Colt, Remington UMC, and Springfield Arsenal. 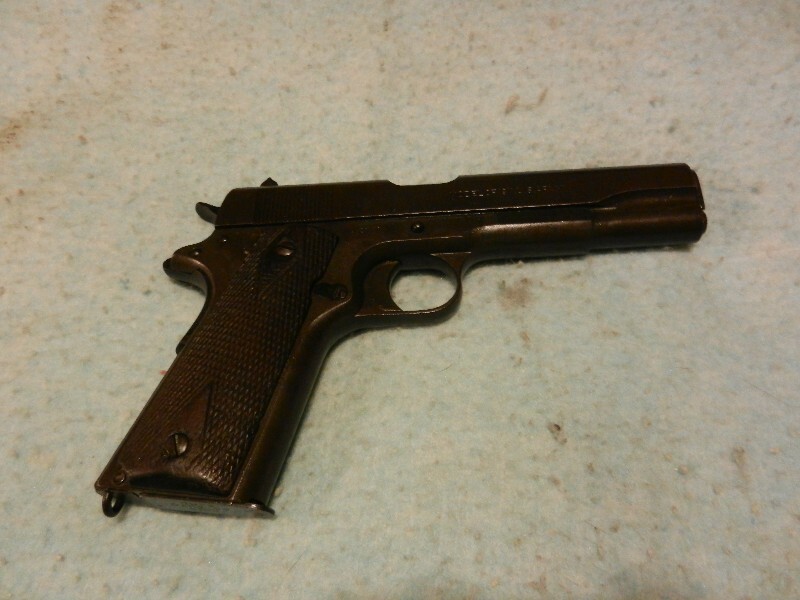 Early models had quite nice bluing, but in 1918 in order to speedup the production process, Colt switched to an oxide type finish, which was actually more black than blue. Thus the 'Black Army' 1911 came to be. Even with this shortcut and some others, and even with other factories also contracted to build 1911 pistols; the US military still did not have enough 1911s during WWI. As a result, other pistols such as the quickly emplemented M1917 revolver were introduced. America's new automatic pistol prooved quite reliable and durable during the war. It was better suited for trench warfare than the German's P.08 Luger and had distinct advantages over older revolver designs such as the British Webley Mk VI or the French Mle 1892. The .45 cartridge also prooved to be plenty powerful enough and popular with the troops. Probably the biggest complaint leveled against the pistol had to do with its sights. 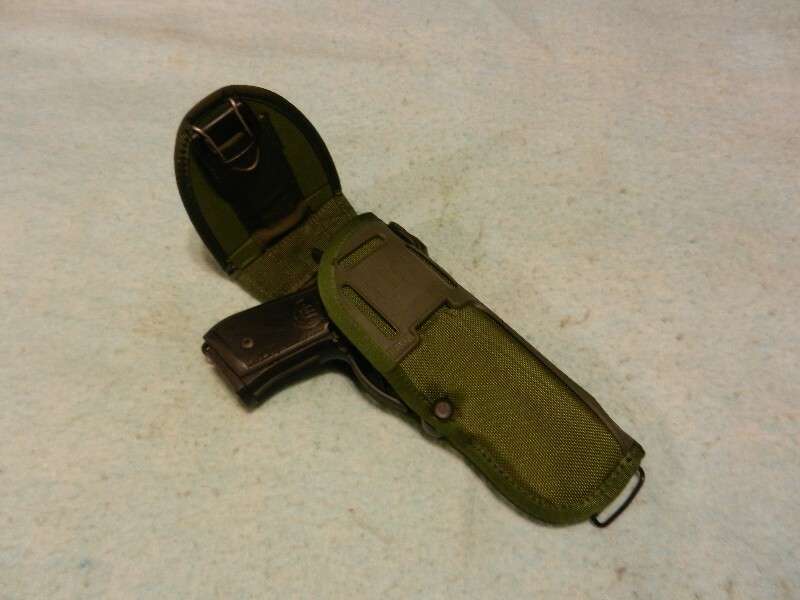 They were made small and fixed so as not to snag in a holster or on equipment, and to allow them to be durable. Unfortunately, these features also meant they were small and difficult for many to properly aim with. Another complaint about the pistol was called 'hammer bite,' meaning the hammer and grip safety would pinch the webbing of a shooter's hand. Otherwise though, the 1911 showed itself to be quite adequate. Its also worth noting, that many pistols went into Russia with the Allied Expeditionary Force in 1919. There it was demonstrated that the Colt could still perform in a chilly climate. Reacting to feedback from soldiers in the field and from lessons learned during WWI; in 1924, the Model 1911A1 was adopted and replaced the original M1911. 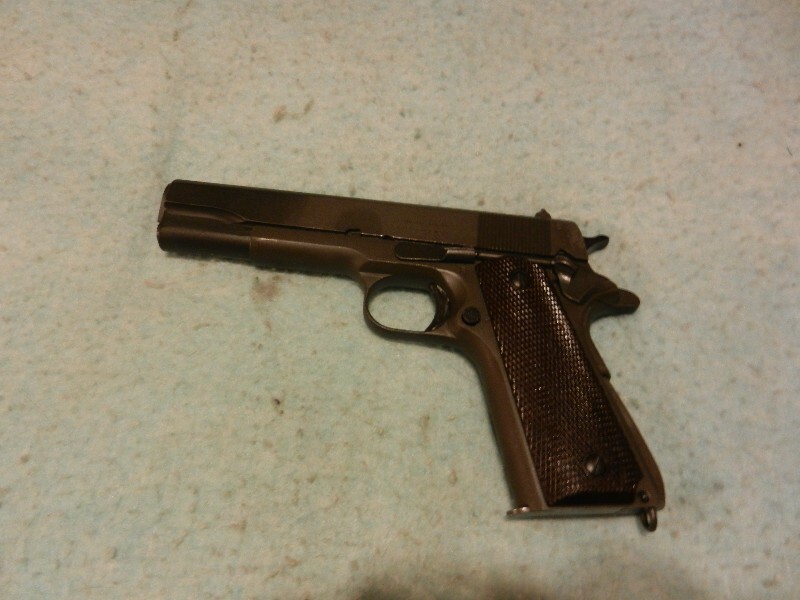 The A1 used the same operating system as the 1911 and even many of the parts interchanged. Most of its modifications were cosmetic, aimed at making the pistol easier to operate and handle. For example, the trigger was made shorter with the A1, was given a pattern on its edge for better traction, and schallips were added behind it on the frame to adjust for the shorter trigger. The mainspring housing or backstrap was changed from a smooth straight style with small lanyard ring, to an arched style with checkering or ribbing and a somewhat larger lanyard ring. The shape of the front sight was changed from a rounded shaped blade, to a semi-triangular one, but the rear sights were left alone. The hammer lost most of its 'spur' and was made smaller; while the grip safety was given a longer tang to help prevent 'hammer bite.' Finally and probably most noticibly, the majority of M1911A1 pistols were built with bakelite grips rather than the M1911's double diamond pattern wood ones. Most A1s were parkerized rather than blued, though early examples were still blued. Of course, later in their service lives, most 1911s and 1911A1s were arsenal referbished and parkerized anyway. Both models remained in service concurrently; older 1911s were not retired and there was not any formal program to update them to the A1 standard. During the 1930s, 1911A1 production numbers were quite low, but of course when the United States entered the Second World War, things quickly changed. From 1942 through 1945 three manufacturers were responsible for A1 production. Remington Rand was the largest with 900,000 pistols to its credit, followed by Colt and Ithaca, both with 400,000 pistols built each. 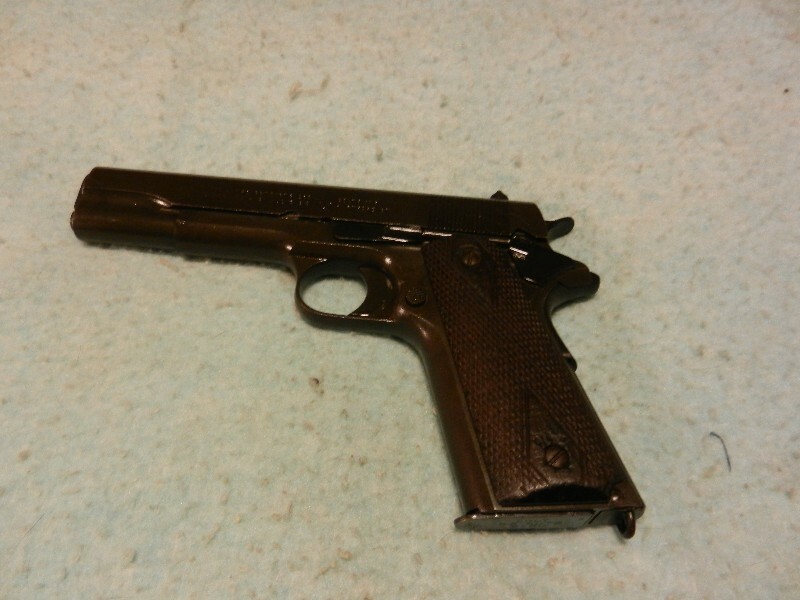 A mear 500 pistols were built by Singer Soing Machine factory during the war as well. Though the military did have some revolvers, the 1911A1 was the standard issue sidearm in the Army and was widely used by both the Navy and Marines. Navy fliers often packed the S&W Victory revolver, but Army Aircorpsmen were issued the 1911A1. The pistol became quite an important tool for soldiers fighting on and in jungle islands in the Pacific and was also quite useful in certain urban combat situations in Europe. While most of the other nations in both WWI and WWII more or less viewed the handgun as a badge of office or a weapon of absolute last resort; the US military actually considered it a fighting weapon-- at least some of the time. As a result, there was more of an effort to put pistols in the hands of more soldiers and give basic instruction in their proper usage. The last 1911A1 pistols ever delivered to the military arrived in late 1945, but their service would continue for decades. During the Korean War, WWII era pistols were pressed into service. The 1911A1's reliability was a great asset in the cold and mud of that war. After Korea, many pistols were recalled and sent in for an arsenal referbishment. Broken or wornout parts were replaced and most pistols were also refinished with the standard matt grey milspec parkerization of the day. After having fought in two or even three wars the pistols surely needed some TLC one could imagine. Savage was contracted with by the government to manufacture replacement 1911A1 slides and many of these can be found on pistols today, but the company never built actual frames. New magazines were also ordered as older ones woreout or were lost. These came from a number of Colt subcontracters mostly. With America's involvement in Vietnam, the old Browning pistol once again went to war, but this time its reputation would suffer some. Many soldiers from that war reported that the pistol was inaccurate, rattly, and even unreliable. These problems were due in large part of course, to the fact that the youngest 1911s in service were 20 years old and some had been in service as long as 50 years. Even with yearly inspections and periodic referbishments, the pistols were simply beginning to breakdown. As a result, revolvers such as the S&W Model 10, became increasingly popular with US soldiers in Vietnam. After the war, it was becoming clear that the military would either have to purchase brand new 1911A1s from Colt or someone else, or would have to consider the adoption of a new standard issue sidearm. AFterall, by the 1970s, the design was beginning to appear rather outdated with its single action only trigger and small 7+1 capacity. A report from the late 1970s stated that the military had roughly 417,000 1911 pistols in inventory, and of those, approximately 100,000 were no longer servicible. 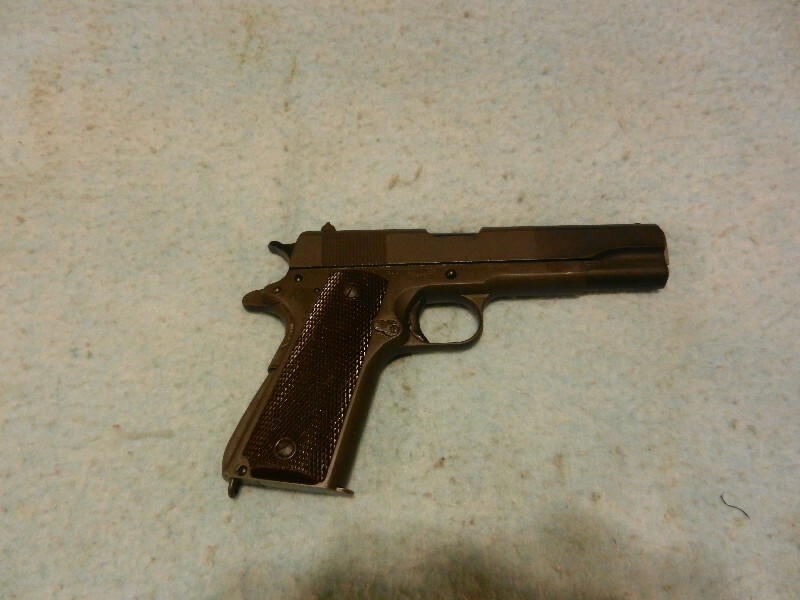 The Model 1917, was not a planned service sidearm for the US military. Rather, when it went to war in 1917, it found itself with a shortage of...well really of just about everything including pistols. Though the Colt M1911 was the standard issue at that time, the military did not have enough in inventory to arm everyone who needed a sidearm and Colt did not have the capacity to produce enough, fast enough. Thus, it was decided to contact both Colt and Smith & Wesson and request each to rechamber their commercial large frame double action revolvers for the military's standard service cartridge: .45 ACP. Colt based its design on its .45 Long Colt caliber1909 Model, and S&W based its own on the .44 caliber Hand Ejector model. So actually, there are two separate and different revolvers with the same designation of M1917, both chambered for the same round and both using moonclips. The moonclips were needed to eject the spent rounds after firing. 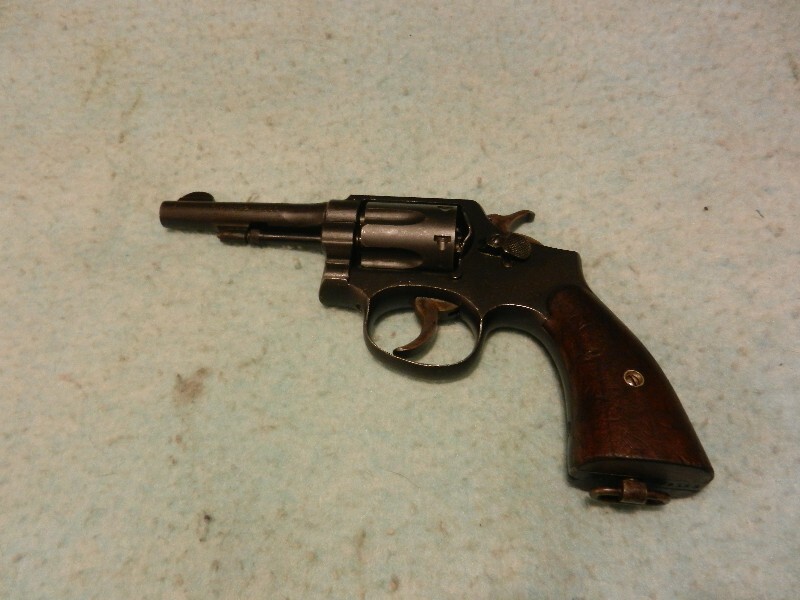 Its worth noting that the S&W M1917's cylinder had a shoulder machined inside each chamber to allow the .45 cartridge to headspace properly, but early Colt revolvers did not. Both did have a lanyard ring at the base of the grip and came with wooden grip panels. The M1917 series was only in frontline service with the American military for the duration of WWI and for a very short time afterwards. It was a solid reliable design, but the moonclips could complicate matters. It was a short term solution, to a legistical problem faced bya military not prepaired for war. Most revolvers were sold off as surplus or given away to allies during the 1920s and 1930s. An interesting footnote to the M1917's history occurred in 1937, when the Brazilian Army ordered 25,000 revolvers from S&W. This was the model's last major production run. A few would also pop-up here and there during WWII, but all in all the 1917 revolver's day was quite short. The Victory Model revolver was a wartime version of the Smith & Wesson Military & Police (M&P) Hand Ejector, based on the medium sized K frame and chambered for a .38 caliber round. Victory production actually began before America entered into WWII in 1941, when S&W began manufacturing revolvers for Britan and other Common Wealth nations. These revolvers had a 'V' prefix added to their serial numbers, as in 'V' for Victory.' They were chambered for the standard British service cartridge of .38/200, which was virtually the same as .38 S&W. These early Victory models had checkered wood grips. They were sandblasted and finished in a military style blue and had lanyard rings. 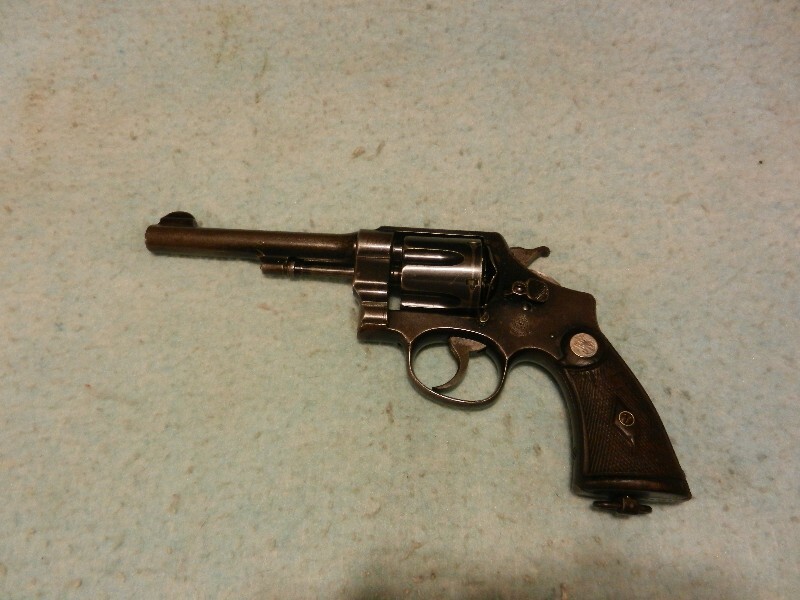 After the US did join the war, S&W ramped up Victory revolver production. 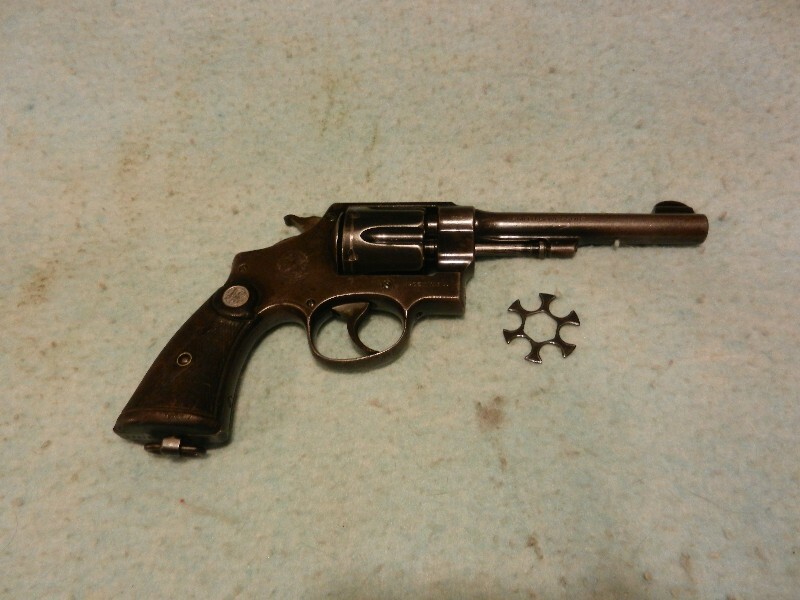 To speed things along, revolvers made after January of 1942, had smooth plane wood grips and later examples were parkerized rather than blued. During the war, an improved passive firing pin safety was introduced into the design. Revolvers with the safety had a VS prefix and ones with it added later had an S manually added infront of the serial's digits. Victory production would continue until 1945, with both the United States and Britan receiving orders. The Victory revolver was standard issue for Navy pilots and aircrews, and was a common sidearm of US Marines too. Many were also carried by security guards protecting military installations and manufacturing facilities on the Home Front. Overall the Victory was a better design than the old 1917 revolver. It was not complicated with the need for moonclips and was shorter and lighter. After WWII, the revolvers were kept in military arsenals and saw service in both Korea and Vietnam. Victories were referbished and refinished as required, the same as 1911s during the same time period. 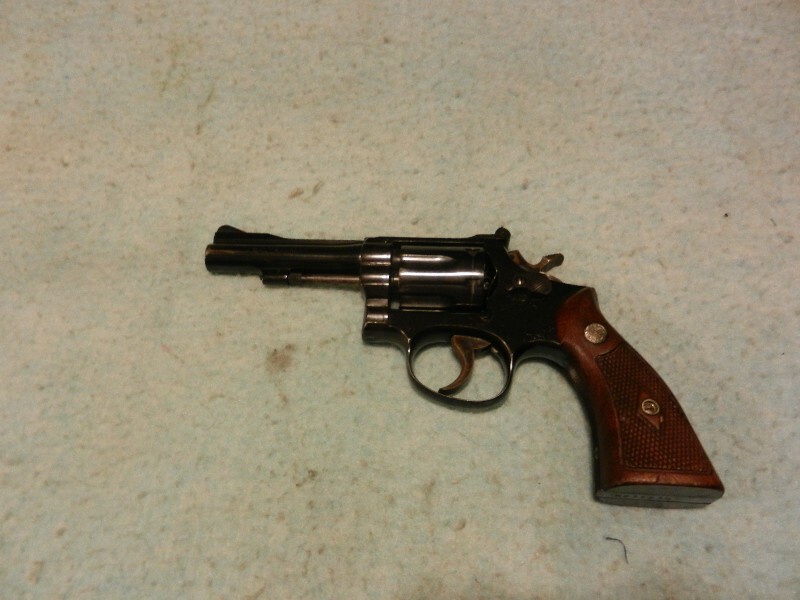 When the Army needed more revolvers during Vietnam, it purchased some commercial S&W Model 10s, usually with 4" barrels. Though some were bought with 2" barrels, for use by helicopter crews. One can read of many accounts of both old Victories and newer Model 10s being encountered in that war. The Model 10 was virtually identical to older M&Ps, just built with more modern methods and with a commercial finish. The Air Force officially adopted the S&W Model 15 in the early 1960s as the M15. These guns were off-the-shelf commercial revolvers in .38 Special with factory blued finishes and standard checkered wooden grips. They had an USAF property and ordnance mark added, but no lanyard ring was installed. Basically the Model 15 was a Model 10 with adjustable sights. The USAF bought mostly the 15-2 and 15-3 variants from 1962 through roughly 1968. Though all started off as blued, some can be found today with arsenal applied parkerized finishes. The M15 was popular with soldiers, though the milspec .38 ball ammunition often issued with it was not. Most were pulled from active service around 1990, but a few continued to be found in armories throughout the 1990s. The Air Force hates to throw anything of any use away. 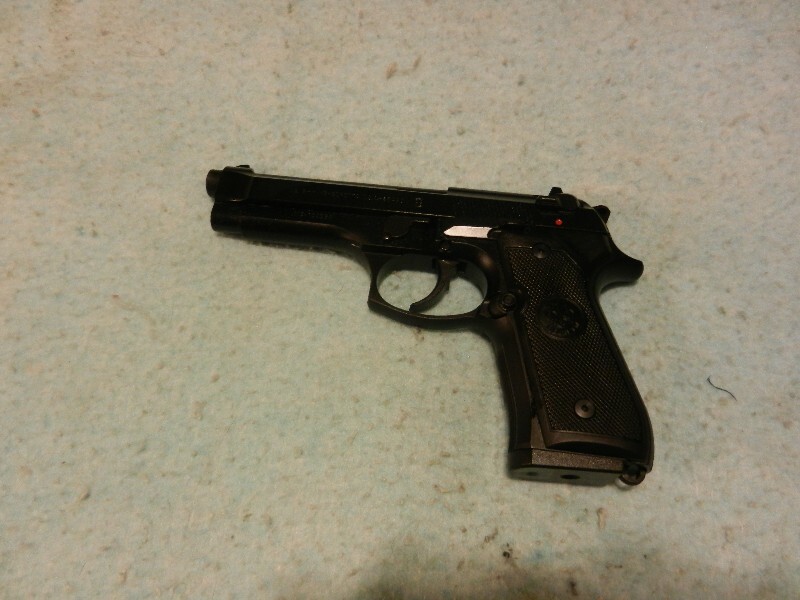 And finally, the famous or infamous Beretta M9 pistol. Some like it, some hate it, and most just like to hate it, but will actually admit its not bad if forced to do so. As with the M1911 nearly 75 years before, the Beretta underwent years of testing and product improvement before it was officially adopted into the United States Armed Forces as the Model 9 service pistol. It is still very much the current standard issue sidearm today. The story of the M9 goes back to the formation of the Joint Services Small Arms Planning Commission in the late 1970s. This was the group that decided that America's military should transition away from the .45 ACP cartridge, and adopt the 9x19mm round in order to have a common handgun cartridge with other NATO member nations. Thus in 1979, trials for a new handgun were announced and it was to be chambered for a slightly modernized version of the 9x19mm Parabellum cartridge, later known as 9mm NATO. Ironically nearly the same cartridge had been tested by the US military in 1903, when it first looked at the Luger. This decision had the unintended side effect of making many marines' heads explode. In 1980, Beretta's entry for the first rounds of trials conducted by the Air Force wonout over others submitted by such companies as Colt, Smith & Wesson, FNH, and H&K. Naturally, feeling that a bunch of flyboys couldn't know much about firearms, the Army contested the results of the trial. Keep in mind, it was also the Air Force that spearheaded the adoption of the M16. A rifle system so terrible , that it only has lasted over 50 years in military service. So in 1981, the Army announced a new round of testing to be named the XM9 trials, which concluded after several delays in 1984. Colt, S&W, FNH, H&K, SIG Sauer, Steyr, Walther, and Beretta all submitted pistols for the finalized XM9 project. Most of the designs were disqualified early on and in the end, it was between the Beretta 92F and the SIG Sauer P226. The two ran neck and neck for a time, with the beancounters even getting involved to see which pistol package would be less expensive, even down to literally a few cents. Naturally, the Beretta 92F pistol won again, and naturally many still continued to protest. Nevertheless, in January of 1985, it was officially adopted into US military service as the Model 9 automatic pistol. The Army, Air Force, and Navy all agreed to the new design; but the Marines resisted and the Coast Guard did not have the funds for large scale purchasing at the time. No not really, only 3 slides actually separated from their frames in the field and no one was seriously harmed, much less killed. During testing, the military was able to reproduce the malfunction 11 times, most occurring after 10,000 rounds and some after over 30,000 shots. Still this was not acceptable and the problem was eventually traced back to soft slides produced in Italy. Some also claim the malfunctions were due inpart to over pressure ammunition having been used, though this doesn't seem to have been the case. In 1988, the metalergy was improved and M9s began to be 100% made in the USA at Beretta's US factory. A slide retention disc was also added to the improved 92FS/M9 design, which even if the slide did break; would not allow it to separate from the frame. 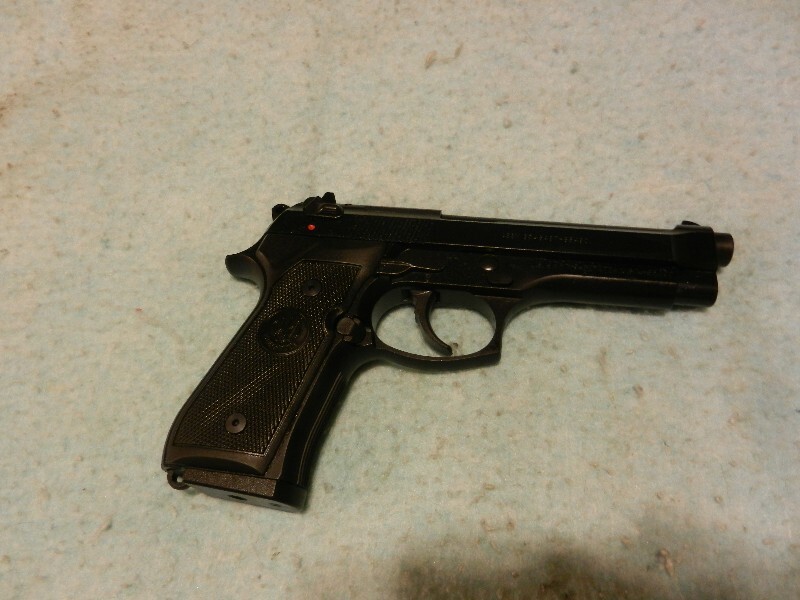 As a result of M9 problems, the XM10 trials were held in 1988 and again Beretta won, with the product improved 92FS, which became milspec for the M9. By 1990, the new pistol began to see widespread use throughout all branches of the military, replacing old 1911s and revolvers, of which many dated back to WWII and even WWI. Despite all of the negativity surrounding it and a bit of a rocky start, the M9 has actually prooven to be a decent service sidearm. It replaced a single action only design with a7 round magazine, whose safety could only be engaged once the hammer was back afterall. The M9 has a smooth trigger in double action, and an acceptably short and crisp single action pull. 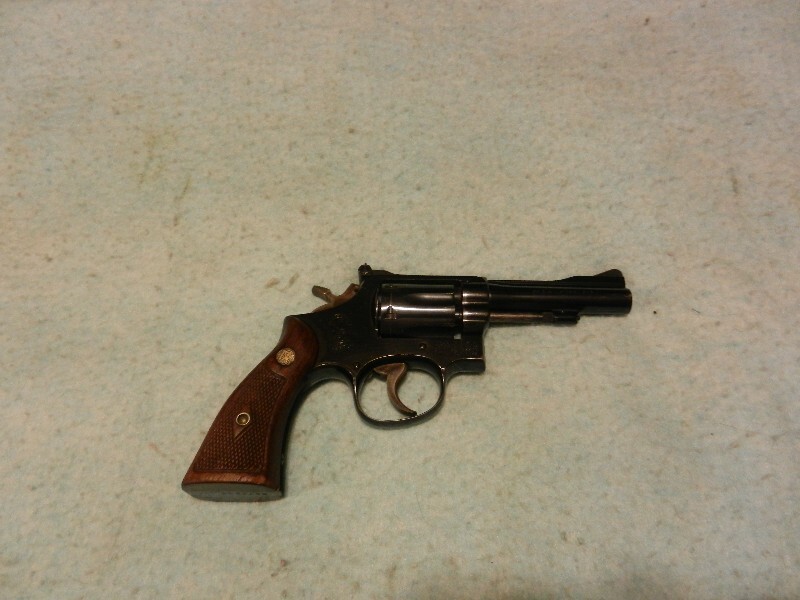 It is lighter than the old Colt, but retains a 5" barrel, and its sights are easier to acquire. It holds 15+1 rounds, and the safety is both ambidextrous and can be engaged with the hammer down. The M9 is reliable and durable, and not highly succeptible to harsh climates. It is easier to field strip and clean than the M1911 as well. So have I sold you yet? Of course the Beretta isn't perfect and has its downsides too, but its not the worst thing ever and the 9mm cartridge can be just as leathal as a .45. The top three complaints that soldiers express about this pistol are: its caliber, its weight, and its grip size. On the other hand, many like its large capacity and its low felt recoil. The M9 began its service in the first Gulf War, and has since seen action all around the globe. There was discussion in the early 2000s of replacing the Beretta with a different design; which many were hoping would return to the .45 ACP cartridge. However, in 2006, further funding for research and testing of possible M9 replacements under the Joint Combat Handgun Program was drastically cut. At the same time, the M9A1 was accepted into service. The M9A1 is a modernized Beretta M9 with the addition of a Picatinny rail under the barrel. 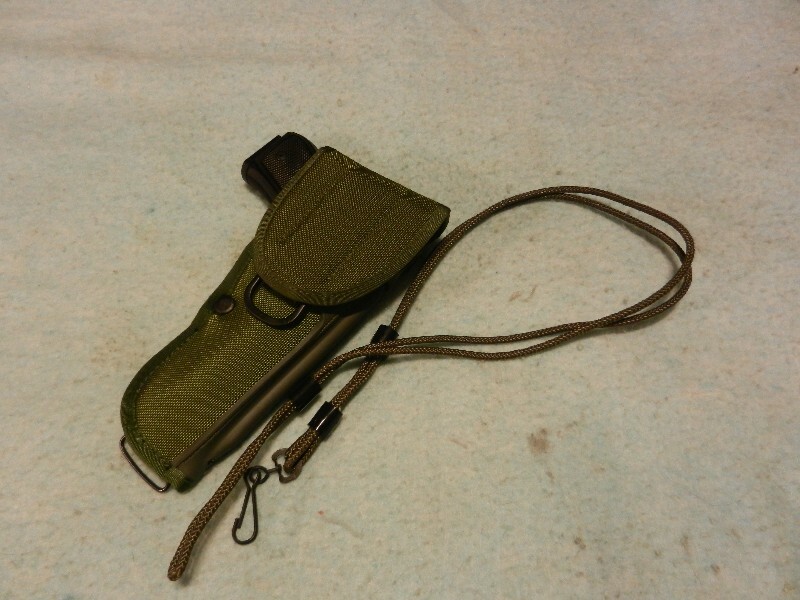 The grip was also redesigned with checkered front and back straps, as well as having a beveled magazine well. At sometime after the turn of the millenium, the M9's trigger and guide rod were changed from metal to milspec polymer to save on weight. The military also decided to move away from Beretta contracted magazines built by Mec-Gar, and instead to go with ones manufactured by CheckMate. The idea was to improve the pistol's reliability in the deserts of Iraq and dirt of Afghanistan, but actually the result was the opposite. More recently, Airtronic has been contracted with to supply M9 magazines to the military. Currently, Beretta US has contracts for both M9 and M9A1 pistols with the government, with on going deliveries scheduled. So it seems unlikely that the platform will be retired anytime soon.